Tennessee House Speaker Beth Harwell, who is running to be the GOP's 2018 candidate for governor, talks in her office in the Cordell Hull Building on Wednesday, April 4, 2018, in Nashville, Tenn.
Editor's note: This is the seventh in a series of stories profiling the major candidates for Tennessee's U.S. Senate and governor seats. This week, we continue profiling candidates in the governor race. Visit timesfreepress.com/politics to read previous profiles. Volunteer/service: Harwell has served on numerous boards, councils and foundations, including the Tennessee State Museum Foundation, the National Foundation for Women Legislators, the Mental Health Association of Middle Tennessee, and the Nashville Children’s Theater Board of Trustees. What’s your favorite book: “Gone with the Wind,” Margaret Mitchell’s 1936 epic set during the Civil War. “You can’t go wrong with the classics,” Harwell said. Harwell has helped end the death tax and gift tax; helped get the state of Tennessee a strong federal bond rating; helped balance the state budget since she 2010; has contributed to Tennessee’s ranking as lowest state government in debt; and ended Common Core testing standards in Tennessee. In her role as Tennessee's speaker of the House and now as a Republican candidate for governor, Beth Harwell is both calculating and caring. It's 11:15 on a Wednesday morning in April, and Harwell, 60, is seated at a table in her Nashville office, listening as four members from the Emergency Nurses Association discuss a topic on the tips of many lawmakers' tongues: the opioid epidemic. "I think Narcan over the counter is a bad idea," one man begins, telling a story about one patient who received the opioid-overdose antidote. Emergency responders took her to the hospital, he says, but before anyone could treat her further, she walked away. Harwell nods. "It's tragic," she says. She continues listening to the nonprofit advocacy group, her hands folded. Having been in politics since 1988, Harwell knows what's coming next: the request. Sure enough, the conversation steers toward the need for tougher punishments for intoxicated people who hurt their medical providers. At the far end of the table, another woman speaks up. "If we were to introduce legislation for felony offenses against workplace violence against nurses, would you support it?" she asks. Harwell has a quick answer. "I can't sugarcoat things," she begins. "A felony would carry a heavy fiscal note." A moment passes. "Because we're looking at prison time." This approach has perhaps been her crowning achievement since Harwell made history in 2011 by becoming Tennessee's first female speaker of the House: Running a fiscally sound state. Look on her website and you'll see the bona fides. She helped end the gift and death tax, making Tennessee a better place for retirees otherwise flocking to Florida. She's helped ensure Tennessee has the lowest state government debt. While fulfilling the state constitutional requirement to pass a balanced budget, she oversees 99 other lawmakers who often have competing needs or requests. 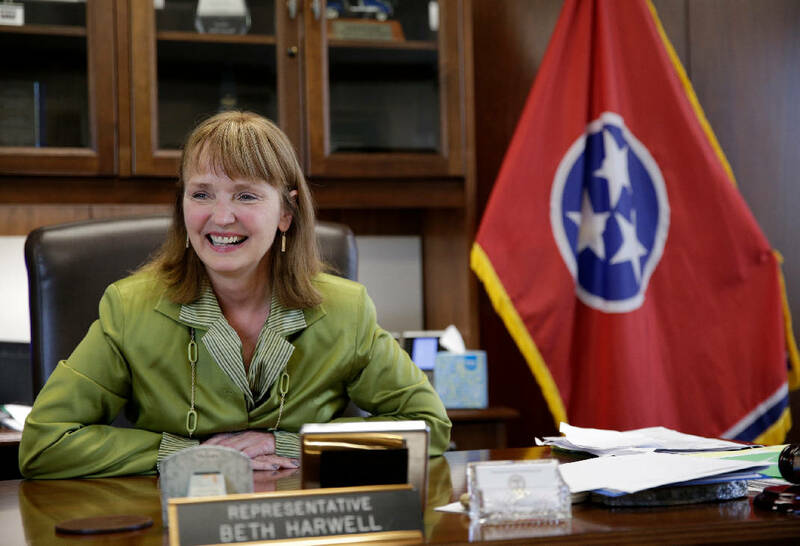 Harwell says fiscal responsibility is the primary reason she threw her name in the hat to become Tennessee's next governor when Bill Haslam steps down next year, with education being a close second for the former Belmont University professor. If she prevails, Harwell would be the first female governor. She is running against U.S. Rep. Diane Black, businessman Bill Lee and former state Economic and Community Development Commissioner Randy Boyd in the GOP primary. "Since the seven years I've been in the leadership role as speaker, we've eliminated two taxes and we've phased out a third tax, making us the third lowest-tax state in the nation," Harwell said in a recent interview. "My No. 1 priority as governor is to make sure our financial health stays in order." Supporters say there's little doubt Harwell has the legislative experience to be governor. But critics wonder how aggressive she is with her run. Harwell entered the race in July 2017 touting her nearly three decades of experience in the Legislature. In 1988, she was first elected to the House and is now the longest serving member alongside Rep. Steve McDaniel, who is not seeking reelection this year. She also served as the state's GOP chairwoman from 2001 to 2004. But so far, her opponents in the Republican primary on Aug. 2 are making more of a splash than her, some experts say. Consider the month of February, when her opponents began releasing 30-second campaign ads for governor. Knoxville entrepreneur Boyd focused on broad-stroke conservative issues. Black, of Gallatin, Tennessee, said she would crack down on illegal immigration. 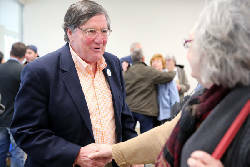 And Williamson County businessman Lee told a story about his first wife's tragic death, and how that inspired his run. Harwell released an ad, too, called "The Signs are Everywhere," in which everyday citizens held up cue cards emblazoned with her accomplishments. "For Beth Harwell, actions speak louder than words," a narrator says about midway through. "She doesn't just talk conservative. She gets it done." Harwell didn't mention her gubernatorial campaign in the ad. And she didn't technically pay for it with campaign money. Instead, a political action committee called Tennesseans for Good State Government helped pick up the $175,000 bill to run the ad 415 times on televisions across the state, according to a report in the Tennessean. Harwell is an officer of that PAC, which started in 2006, and which was called "Harwell PAC" until mid-December 2017, the same news account says. In March, Harwell released a second, more sober ad looking at her work on the opioid crisis. Again, she lauded her work as speaker but never mentioned her campaign for governor. As a result, Harwell faces three pending ethics complaints filed by critics in Tennessee's Tea Party. The complaints say she participated in creating campaign materials that a PAC helped pay for. But Harwell's campaign has denied that it's campaign related since it doesn't mention the gubernatorial run. In May, the state's Registry of Election Finance voted to wait on taking any action, according to a news report. Harwell's ads have Bruce Oppenheimer, a political science professor at Vanderbilt University, wondering how aggressive she plans to be in her run. Harwell could have been handicapped by the legislature, which was in session from January to late-April. Or, she could have some "interpersonal reason" that explains her decisions to date, Oppenheimer said. "Either way, the campaign has not looked terribly aggressive," Oppenheimer said in April. "They did one spot on TV that didn't have high production value, and I just don't see the visibility of the campaign." That visibility, Oppenheimer says, is crucial in a Republican primary where every candidate is trying to show voters how conservative they are. Oppenheimer pointed to ads from Black, in particular, that show the candidate promising to crack down on the hot-button issue of illegal immigration. Available information shows that strategy has some teeth. According to an early April poll from Middle Tennessee State University, Boyd and Black had the most favorable views, followed by Harwell then Lee. Harwell isn't the wealthiest candidate in the race, though she has the money to be competitive. According to her campaign finance reports, she received about $5 million. Her advocates say her greatest strength isn't money, but the support she's built among Republicans over her years in the legislature. "Remember, this is a Republican primary," said McDaniel, who often votes with Harwell on issues. "And her past experience with the Republican Party, having been its chairman, means that she has connections throughout the state, a grassroots support system that I don't believe her opponents have." Back in her office, Harwell says goodbye to the emergency nurses group and returns to her desk. She folds her hands, straightens her back, takes a deep breath. It's not yet lunchtime and it's already been a busy day. Harwell started her morning in the legislature, rattling through bills with her fellow lawmakers. Then came the nursing group. She's scheduled to meet another advocacy group before lunch. Next comes legislation review and campaign work. "Lord help me if I'm going to get through this campaign," she jokes. Unlike many politicians, Harwell is not a lawyer. She grew up in a rural community in Pennsylvania, the youngest of five children, and moved to Nashville at the age of 16 to attend Lipscomb University, a private religious school in Nashville. Before politics, Harwell said she dabbled with a few jobs in the private sector and taught political science to college students at Belmont University. Harwell undoubtedly espouses some right-wing ideas: She opposed removing a Confederate bust from the capitol in 2017. She stood behind President Trump's desire to remove protections for American children born to undocumented parents. That program is called Deferred Action for Childhood Arrivals, or DACA. Harwell also helped shoot down Haslam's proposed health care expansion in 2015. But while she takes a conservative, more incremental approach to governing, some of Harwell's ideas are moderate, which has earned past rebuke from tea party opponents who branded her a RINO: Republican In Name Only. Consider her stance on the opioid epidemic: "I am a firm believer in recovery courts, because, as I've said, we are not going to incarcerate our way out of this problem." Or suing drug manufacturers to get their attention: "I do think our state has a role in fixing this. As a matter of fact, I wrote a letter to our attorney general in 2017 asking him to participate with the other states on the lawsuit. I have reached out to the pharmaceutical industry and requested that they come forward and say, 'We want to help with rehab.' Because they obviously have the resources to help us." And reducing the fear of criminalization among those struggling with addiction: "I think it's important that we have take-back facilities, and that we give people an option to come forward and not be criminalized for doing so in order to receive the help they need." On the day the nursing group visited, Harwell was looking at House Bill 2181, which would give money to local jails for creating job programs for inmates. Earlier this year, Harwell also supported a failed bill that would legalize certain uses of medical marijuana. The inspiration came from her sister, who fractured her back during a yoga class in Colorado and ditched her prescribed opioids. "She took two of them and she said to me, 'If I continue to take these, I will be an addict, there's no doubt in my mind. This stuff is powerful,'" Harwell said. "And so instead, she got a small jar of medical marijuana; it was really kind of like a crystal. And she used it for about a week, healed up, and is doing great. I can't tell you how many constituents across the state have given an example of their child having seizures and how this would help them so much." Harwell is "very pro-Second Amendment," but said she doesn't want to arm teachers. Harwell was opposed when lawmakers proposed such a bill after the Parkland, Florida, shooting in February. And she took the same position after the Sandy Hook shooting in 2012. "I do think it's important that we have armed people in our schools now, unfortunately," Harwell said. "But I think it was wise on the part of the legislature not to arm teachers. There's just two different roles there."